Download "Frontomaxillary and mandibulomaxillary facial angles at 11 + 0to13+ 6 weeks in fetuses with trisomy 18"
4 FMF and MMF angles in trisomy (a) (b) Frontomaxillary facial angle ( ) Mandibulomaxillary facial angle ( ) Figure 3 Reference range (mean, 5 th and th centiles) of the frontomaxillary facial angle (a) and the mandibulomaxillary facial angle (b) in chromosomally normal fetuses. 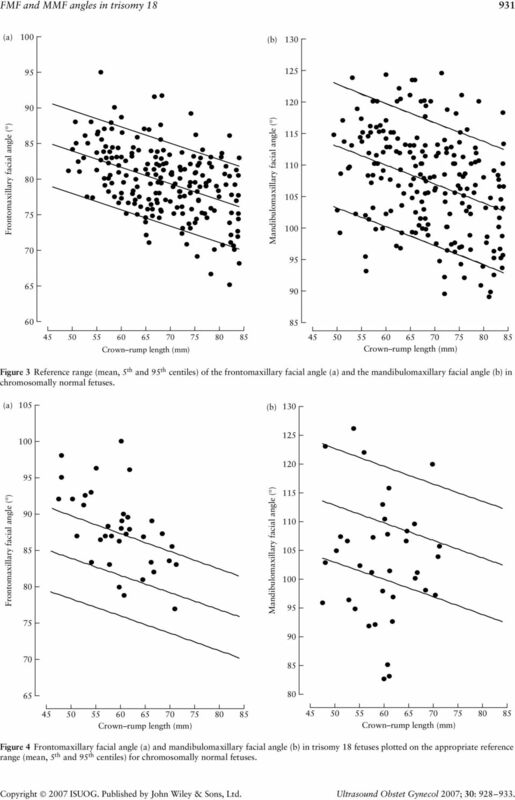 (a) 105 (b) Frontomaxillary facial angle ( ) 80 Mandibulomaxillary facial angle ( ) Figure 4 Frontomaxillary facial angle (a) and mandibulomaxillary facial angle (b) in trisomy 18 fetuses plotted on the appropriate reference range (mean, 5 th and th centiles) for chromosomally normal fetuses. 5 932 Borenstein et al. 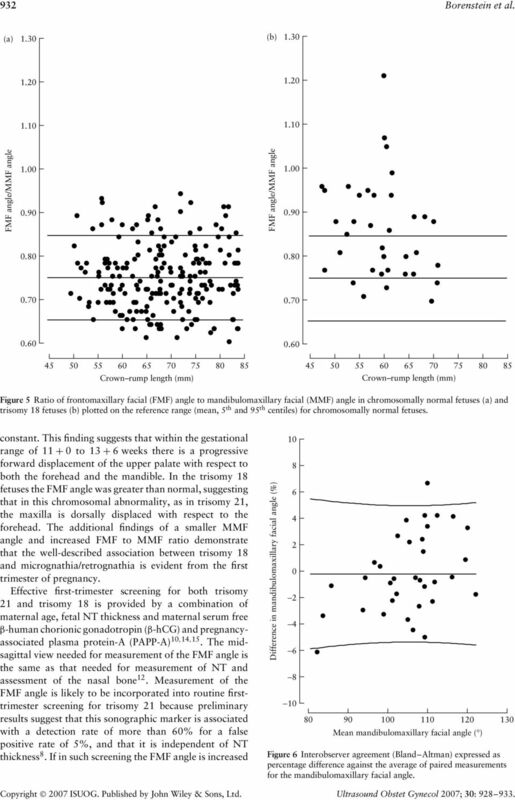 (a) 1.30 (b) FMF angle/mmf angle FMF angle/mmf angle Figure 5 Ratio of frontomaxillary facial (FMF) angle to mandibulomaxillary facial (MMF) angle in chromosomally normal fetuses (a) and trisomy 18 fetuses (b) plotted on the reference range (mean, 5 th and th centiles) for chromosomally normal fetuses. constant. 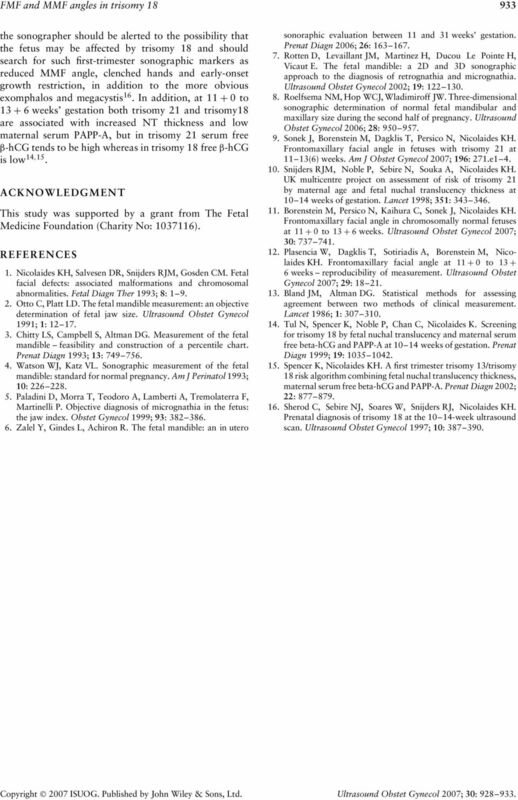 This finding suggests that within the gestational range of to13+ 6 weeks there is a progressive forward displacement of the upper palate with respect to both the forehead and the mandible. 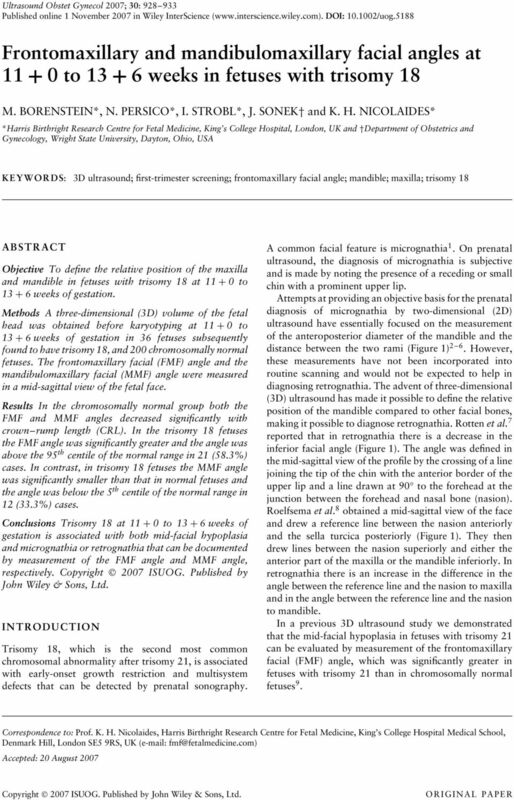 In the trisomy 18 fetuses the FMF angle was greater than normal, suggesting that in this chromosomal abnormality, as in trisomy 21, the maxilla is dorsally displaced with respect to the forehead. 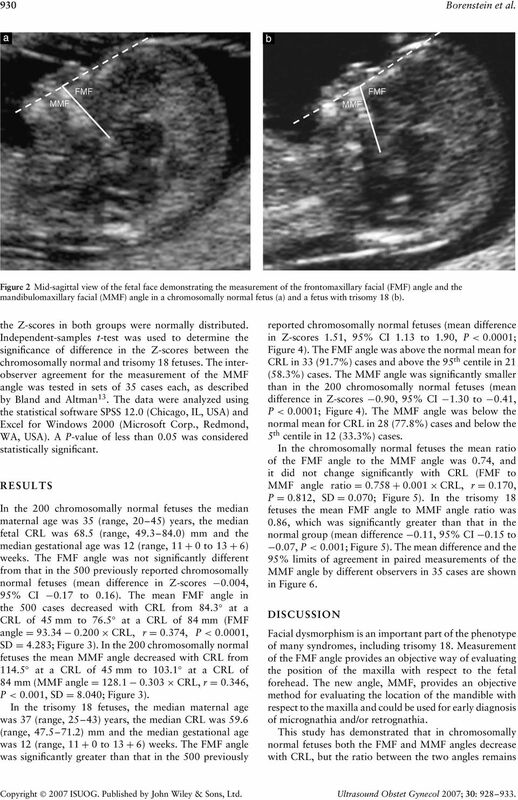 The additional findings of a smaller MMF angle and increased FMF to MMF ratio demonstrate that the well-described association between trisomy 18 and micrognathia/retrognathia is evident from the first trimester of pregnancy. Effective first-trimester screening for both trisomy 21 and trisomy 18 is provided by a combination of maternal age, fetal NT thickness and maternal serum free β-human chorionic gonadotropin (β-hcg) and pregnancyassociated plasma protein-a (PAPP-A) 10,14,15. The midsagittal view needed for measurement of the FMF angle is the same as that needed for measurement of NT and assessment of the nasal bone 12. 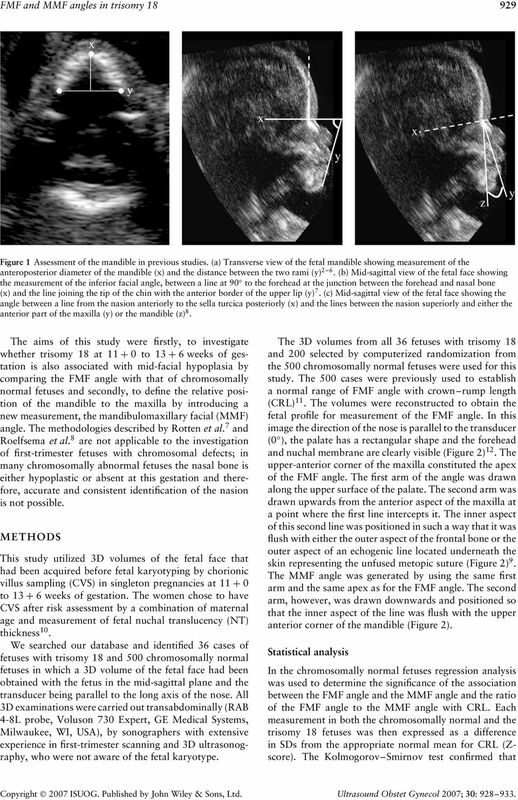 Measurement of the FMF angle is likely to be incorporated into routine firsttrimester screening for trisomy 21 because preliminary results suggest that this sonographic marker is associated with a detection rate of more than 60% for a false positive rate of 5%, and that it is independent of NT thickness 8. If in such screening the FMF angle is increased Difference in mandibulomaxillary facial angle (%) Mean mandibulomaxillary facial angle ( ) Figure 6 Interobserver agreement (Bland Altman) expressed as percentage difference against the average of paired measurements for the mandibulomaxillary facial angle. Fetal Lateral Ventricular Width: What Should Be Its Upper Limit?